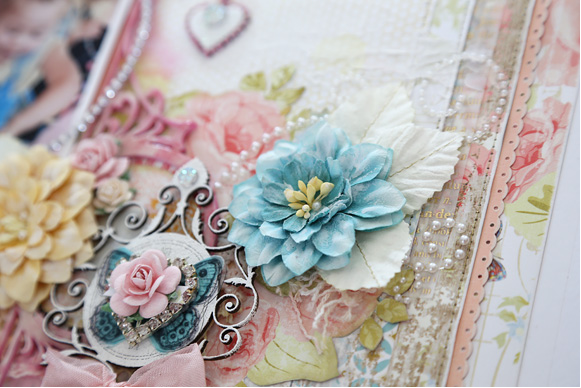 Hi Your Creative Wings friends, Jodie with you today and I'm very excited to have had the chance to play with the gorgeous New Release, they're simply stunning! I snapped this lovely photo of my Grandma and cousin on the way home from my Uncle's wedding a couple of years back. 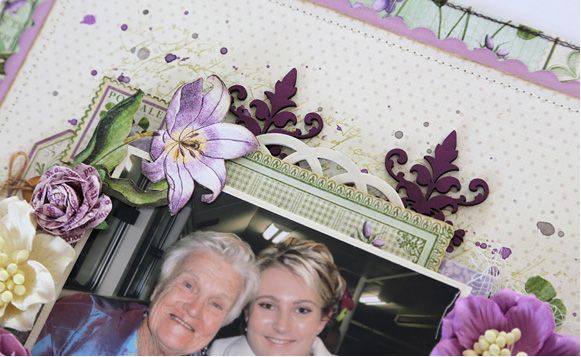 With various shades of purple currently making a return to favor in scrapbooking products, it was the perfect opportunity to dedicate a layout to this favorite photo. I've used the two March papers from Graphic 45's A Time to Flourish collection, and a soft Pion Designs paper as a neutral background. 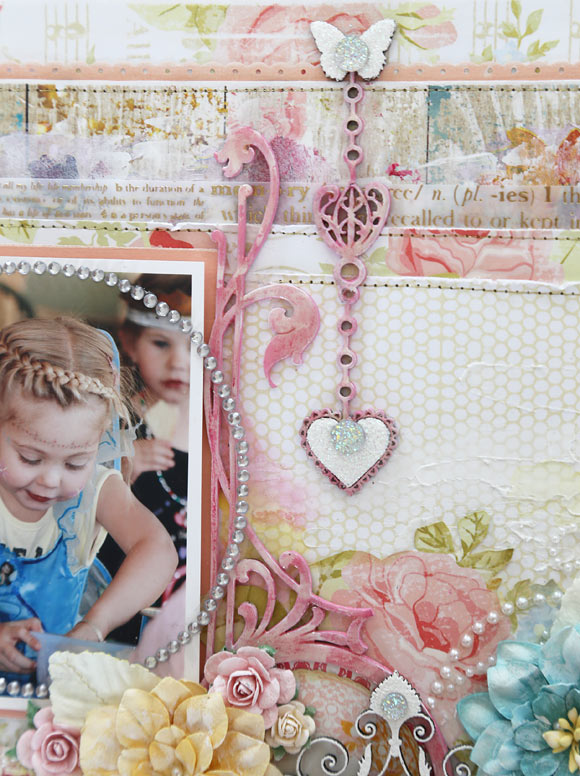 The new YCW Damask Background chippy is just gorgeous! 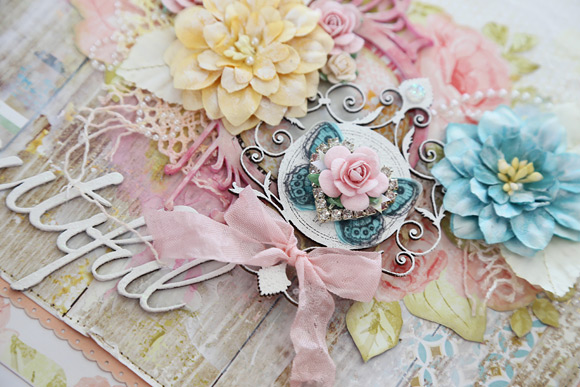 It's so detailed and so very pretty. I've also used the largest piece from the new Doilyz Nest and the Love You scripted title. I wanted the Damask Background to really pop off the page, and used Versa Colour Ink in the bright and rich Boysenberry to ink directly onto the chipboard. I always seem to get glue everywhere, but found an easy way to adhere the Damask Background to my layout was to use a sponge to apply PVA glue to the back of the chippy before adhering it to the page. 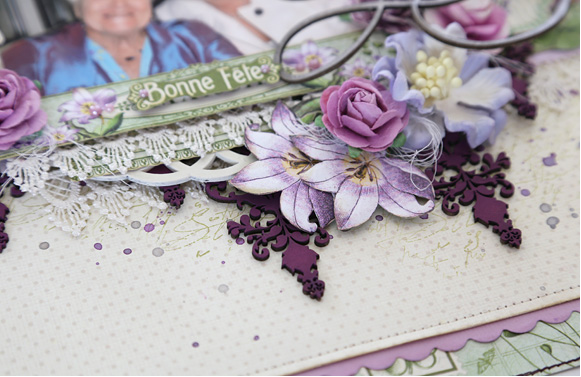 I found this gave good coverage without any excess glue seeping out from the edges of the intricate design. I've used the largest of the Doilyz Nest pieces. This is a great value chippy, with 6 individual Doilys in one piece of chipboard. I applied two coats of a Jo Sonja's background paint in cream. Jo Sonja's background paints are specially designed for base coating and give great coverage, so I didn't need to prime this piece with Gesso. I then heat embossed with clear embossing powder for a nice gloss finish. 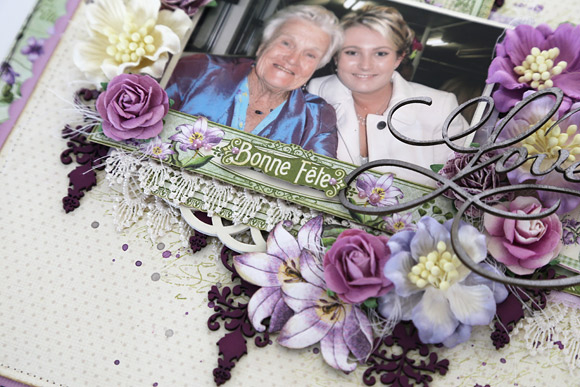 Your Creative Wings Products Used: Damask Background YCW16016, Doilyz Nest YCW13005, Love You scripted title. YCW1062. Other Products Used: Graphic 45 A Time to Flourish patterned paper, Pion Design A Day in May patterned paper, Bazzill cardstock, vellum, Prima Marketing Inc flowers, Green Tara flowers, lace, ribbon, gauze, twine, Prima Marketing Inc stamp, Versa Colour Ink in Boysenberry and Bamboo, Tim Holtz Distress Ink in Frayed Burlap & Antique Linen, Jo Sonja's background paint, Kaisercraft pearls, clear embossing powder, Fiskars edge punch, thread, Tattered Angels Glimmer Mist in Pop Rocks & Silver Sugar. 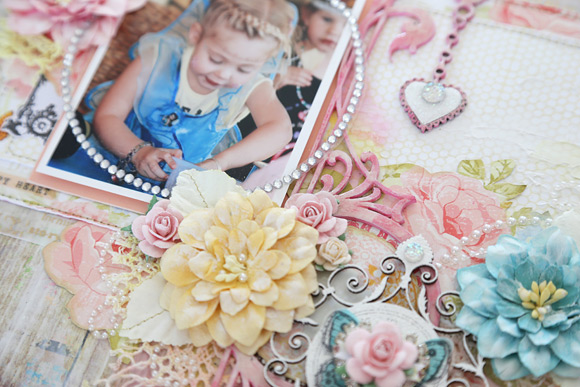 My second layout features my beautiful niece Milly on her third birthday. She was dressed as a fairy and even had a special fairy braid in her hair. I wanted to create the soft and gentle feeling of a fairy garden around her. I've used the Wrought Iron Clock as a base and added several layers. I've heat embossed it in white and then added a butterfly punched from turquoise vellum, another butterfly stamped with black Stazon Ink over acetate and then fussy cut, a heart charm, a teeny tiny banner and a flower. I've then added some bling and tied some satin seam binding to finish it off. 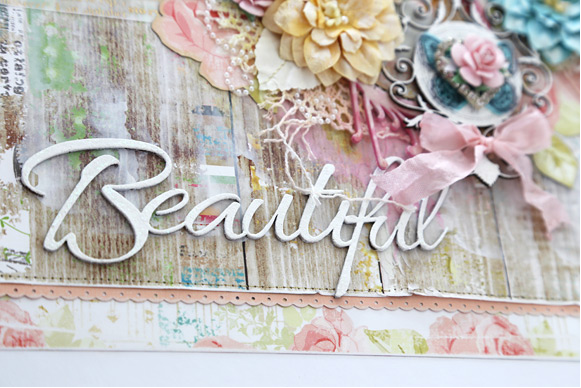 The Beautiful script title I've treated in one of my favourite ways with two layers of gesso and some Kindyglitz in Crystalina. As with so many YCW chippy pieces, Key to my Heart Charm can be separated so that different mediums can be applied easily to different parts of the chippy design. I've separated out the inner piece of the heart and base coated in gesso before applying Mod Podge and white glitter. Once pieced back together I've added one of the Mini Butterflies to the top of the charm and added some bling. To create the marbled effect on the Ornate Frame 17 and Charm I base coated in gesso before applying pink acrylic paint. I wasn't happy with the colour at that stage so added a few dabs of gesso with my fingertips and this created the two toned or marbled effect. Once dry I added Glossy Accents for a beautiful gloss finish. I love how these pieces turned out. 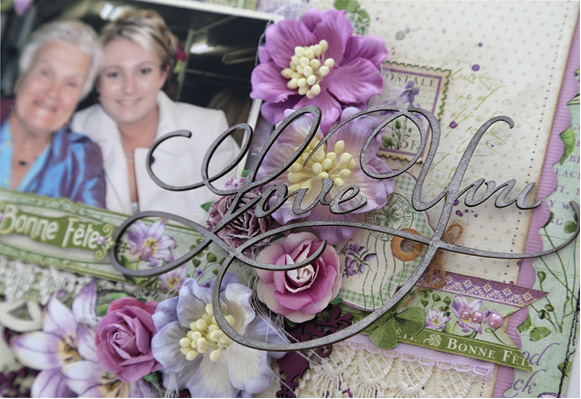 Your Creative Wings Products Used: Wrought Iron Clock YCW16017, Ornate Frame 17 MediumYCW6020, Key to My Heart Charm YCW12013, Word - Beautiful YCW1012, Corner Scroll YCW7011, Butterflies Mini YCW 2042. Other Products Used: Webster's Pages Nest Collection patterned paper, Coredinations Cardstock, Maggie Holmes Open Book gold foil vellum, Doodlebug Design vellum, EK Success edge punch, Martha Stewart butterfly punch, Prima Marketing Inc & Kaisercraft stamps, Stazon ink, acetate, acrylic paint, gesso, white embossing powder, Glossy Accents, Kindy Glitz in Crystalina, Prima Marketing Inc Say It In Crystals, My Two Angels crystal circle and heart, satin seam binding, Prima Marketing Inc flowers, Green Tara flowers, Manor House Creations leaves, gold thread, Whipped Spackle, Caran d'Ache Neocolour in Golden Yellow, Gelato in Watermelon, LuminArte Twinkling H2O in Peppermint Taffy, Lindy's Stamp Gang Flat Fabio in Chateau Rose & Bonjour Butter, lace, ZVA Creative pearl flourishes, white glitter, Tim Holtz Distress Ink. Thanks for stopping by today! If you haven't visited the YCW shop recently be sure to check out all of the new release designs HERE.